Here is an illicit sneak preview of The Library at Elsinore as it appears in Gallery II of the Royal Academy's Summer Exhibition. 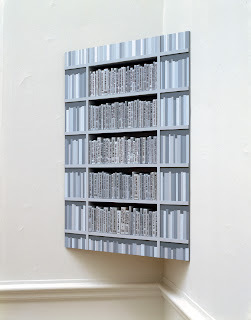 The mock bookcase contains real books overpainted in grey with titles borrowed from Hamlet in black. These are titles of actual books by actual authors in order of the apprearance of their words in the play. There must of course be more no doubt being borrowed as I write but these are all that my research has turned up. Most are (rightly I presume) obscure but others are by known writers from Lloyd George to Graham Greene with, most recently, Alan Bennett's Single Spies (Simon Callow suggested, he claims, this brilliant choice of title). There is in fact a real library at the real castle of Elsinore. Its curator has shown an interest in exhibiting this phantom work. Shandy Hall is in prospect and who knows but that the Folger may live up to its name and follow suit.